Harmful algal blooms (HABs) are micro algae found in all aquatic environments; some of these produce potent natural toxins have been associated with a range of diseases, ranging from gastrointestinal illness and asthma exacerbations to possibly an increased risk of neurodegenerative diseases (ALS, Parkinson’s, and Alzheimer’s). HABs appear to be increasing in all aquatic ecosystems worldwide, associated with increased nutrients and possibly climate change. Many algal species produce blooms, only some produce toxins. In the context of climate change, we can expect these species to mix, and their tendency to form blooms to change in the future, possibly causing more human health impacts. 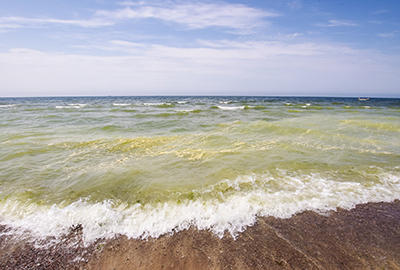 This project uniquely leverages new Met Office capabilities to link coastal and oceanographic processes with remote sensing data to explore the possible link between harmful algal blooms (HABs) and climate change. The research links historical time series of marine meteorological data with the records of the biotoxin monitoring programme run by Centre for Environment, Fisheries and Aquaculture Science (CEFAS) and the Scottish Association of Marine Science (SAMS) on behalf of the Food Standards Agency (FSA). The historic oceanographic (e.g. currents, sea surface temperature, sunlight, undisturbed water) and remote sensing data (e.g. bloom chlorophyll) identify the timing and location of the HABs in all aquatic systems. These data are modelled (both forecast and hindcast) to link with Met Office climate change measures (e.g. temperature). We will be exploring whether there is an association between recent climate variability and the observed occurrence of blooms of the specific species sampled in the CEFAS/FSA programme, and hence to form hypotheses about the likely changes in blooms of these species in a future climate change scenario. Health endpoint data from a variety of sources (e.g. hospital episode statistics [HeS]) will be linked to explore acute and chronic diseases possibly associated with HABs and residence relative to coasts and other water bodies using time series and case-crossover analyses. The expansive scale in time and space, as well as the large sample sizes of the human health databases, provides sufficient data to explore the climate change-HAB-human health hypothesis and other aspects (e.g. identification of potentially vulnerable populations, modelling for early HAB warnings).